Two old Chinese maps have been discovered showing that the Dokdo islets belonged to Korea, further undermining Japan's flimsy colonial claim to the rocks. The two maps were made in the 19th century during the Qing Dynasty and were unveiled by Lee Myeong-hee of Kyunghee University's Humanitas College at a seminar on Sept. 6. One is an eight-piece folding-screen map of the world from 1845 and depicts Ulleung Island and Dokdo in close proximity to the Korean Peninsula, clearly showing that they belonged to the Chosun Kingdom. The other map, created in 1851, depicts Ulleung Island and Dokdo in the same way. Lee Sang-tae, another researcher who also presented his findings at the seminar, said, "Study of maps produced by Japan's Shimane Prefecture," which claims ownership of Dokdo, "shows that Dokdo was not identified as part of the prefecture for around a dozen years just before and after it illegally laid claim to Dokdo in 1905." 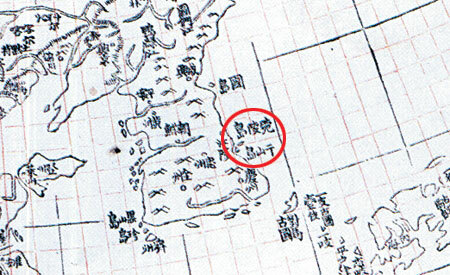 Japanese maps dating back to 1895 and 1899 and even those from 1908 and 1912 show Dokdo excluded from Japanese territory. Maps from 1948 following Japan's surrender in World War II and from 1963 also do not include Dokdo in Japanese territory, according to Lee. The expert said this was because Japan "lacked any confidence" in claiming the islets.